Charles B. French Official Site: How I Met Your Mother: "Tailgate"
Spoilers ahead, so watch the episode before you proceed. Of course, you are free to proceed without viewing the episode, but then don't whine to me about spoilers. Best Episode Moment: Marshall realizing that he's taken on his father's role of tailgate king. Best Sandy Rivers Moment: "Bathroom break." Best Allegorical Moment: Marshall and Lily arguing about whether to teach their child to believe in something greater than themselves: werewolves and Bigfoot. Best Line: "I've always wanted to be a bartender. It's just like being a therapist: you listen to people's problems, pretend to care, but you can drink openly instead of hiding your booze in a coffee mug." Best "That Takes Me Back" Moment: I remember those Time Life books. Those commercials were pretty creepy. Best Character Progression: Robin decides that it's time to put the whole sucky 2011 behind her, and I couldn't agree more. Let's get back to her being awesome. Worst Character Regression: Ted and Barney reverting to their desire to run a bar. Again. Best Dream Meeting Reality Moment: We find out why drinks in bars are so expensive. Best Unanswered Question: Why are the hats wet? Best Sagat Narration: Kids, here's why we didn't have a problem with that. Best Callback: Slap Bet, the board game. Any hint about The Mother? No, but I'm sure she thinks the "why is it called Puzzles?" question is cute. Any hint about The Wedding? No, but let's hope it goes better than this attempt to run a bar. Do we like Ted this episode? Not really. Once more he recklessly follows his ill-advised passions and runs them into the ground, ruining things for everyone. Overall Opinion of the Episode: I liked it. It was chock-full of callbacks. While some episodes rely on callbacks to cover for an otherwise weak episode, this one had it's own strengths. I absolutely loved Marshall tailgating with his dad. It was a sweet plotline that is exactly what Marshall would do. Marshall was trying to reconnect with his dad, and he thought that he had to spend that moment alone and was frustrated by the constant interruptions. Instead, he found out that his tailgate party was his way of not only remembering his dad, but keeping his legacy alive. He wasn't just wallowing in the past, but carrying on his traditions to the present. And as usual, it's great to see Bill Faggerbakke again. The Robin and Sandy plotline was also funny. Sandy is a great character and a perfect foil for Robin, and it's about time they brought the old band back together. Sandy and Robin were a great pair in season one, and it seems they'll be teaming up again. It's a great way to have Robin be the mature, strong one when paired up with a larger-than-life scenery-chewing sleazebag-like Sandy. This was some good character growth, and I want to see where this goes. I liked Kevin's enthusiasm and willingness to go along with Ted and Barney's crazy scheme (more on that in a moment) and he was equally good in encouraging Robin to be a better person. Once more he demonstrates that he's too good for this group, but I still like him around. However, having a character who is always agreeable and never in conflict with everyone else isn't the stuff of strong comedy or drama. While I can understand the writers' unwillingness to risk another Zoey, I'd love to see Kevin as a better foil in these episodes. His best moments this season were his constant questioning of the gang, making meta-observations about the series, and I'd love to see more of that. Marshall and Lily had some good moments of growth. Their argument about what beliefs they wished to instill in their children is a perfect allegory for couples who have to figure out what, if any, religious beliefs they will instill in their children. In Marshall's case, it's not belief in the divine, but the supernatural, and we learn that he got it from his dad. It makes a lot of sense that he'd be so passionate about things he learned from his dad (including the true origins of Spam). Lily's reluctance to teach her child those things also make sense, as they stem from her constant disappointment in her father. (The equally lovable Chris Elliot.) In the end, I like that Lily finally has a chance to believe in something thanks to her father, who actually came through for her in his own way. This is often a problem when a show has a specific end in mind for the characters, but it doesn't know what to do between now and that end. Ted is supposed to meet the love of his life, fall in love, and become a devoted husband and loving father (who tells very inappropriate stories to his children.) Barney is going to get married. However, rather than slowly but surely take us that direction, the show seems content to let these two characters tread water, and each week I grow more and more dubious of their alleged future growth. There are ways of keeping our characters lovably goofy while allowing them to grow, but that's something this show has forgotten. 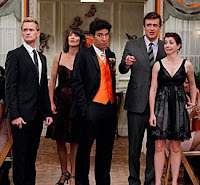 So while overall I liked this episode and found many of its moments hilarious, if not wonderfully sentimental, it once more reinforces the fact that it doesn't know what to do with Ted and Barney. While we're unsure whether Barney actually goes through with the wedding, we know Ted marries the love of his life. But once again, episodes like these make me wonder why she'd want to marry him at all.